I THOUGHT I MIGHT make it through a local holiday theatrical production without crying. 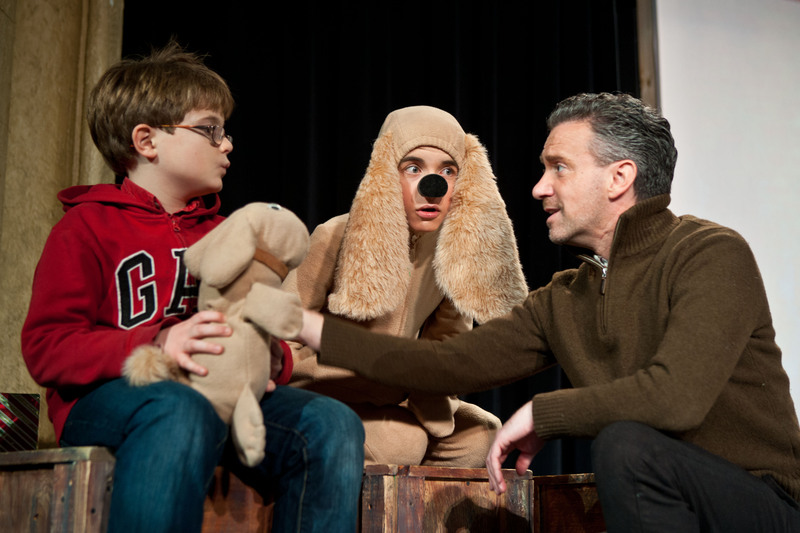 The Santa Diaries actors, left to right, Thomas Drenth as Timmy; Samuel Temple as Marley the Dog; and Michael Lambert as Will Hawes. Photo by Edward Brown and courtesy of The Merlin Players. Saturday evening found me seated on the far right side of the Bahl Family Auditorium, near the back of the Paradise Center for the Arts restored theatre in historic downtown Faribault, wiping away tears during The Merlin Players performance of The Santa Diaries. The play penned by Mala Burt and Laura Ambler and debuting in Minnesota, in Faribault, resounds with the age-old theme of discovering what is truly most important in life. For main character Will Hawes, played by seasoned actor Michael Lambert, that is deciphering whether he truly values his success as a Hollywood actor over love and family. A return to his small hometown at Christmas causes Hawes to reexamine his choices in life. 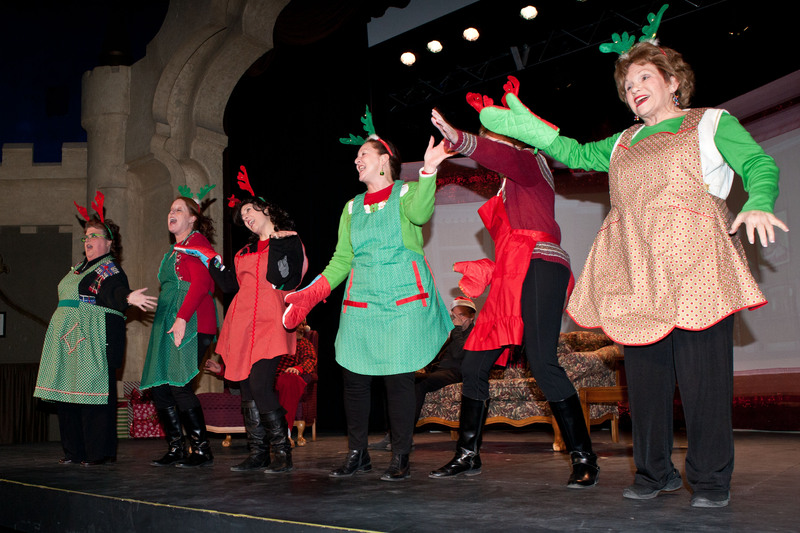 This holiday chorus line will put you in the Christmas mood and have you laughing out loud. Photo by Edward Brown, courtesy of The Merlin Players. That could be the mantra for a production that mixes serious topics with humor. From the Hotdish Ladies (“Casseroles” in the original script, but this is Minnesota) bearing Sweet Potato Hotdish to a chorus line to the moment that made me cry—hearing the inner thoughts of Martha (played by Stephanie Weiss) wanting nothing more than her family home for Christmas—The Santa Diaries touches the heart. You will laugh. You may cry. And, with absolute certainty, you will consider your own family and your life priorities as The Santa Diaries unfolds. While The Santa Diaries presents a rather predictable happy ending—hey, you can’t have a holiday show that ends badly—real life isn’t that way. I know that. You know that. Life is messy. Work and distance and disagreements and busyness keep families apart. But there is hope. People change. Situations change. We grow older and wiser. And, like main character Will Hawes, we eventually figure it out, that family is more important than money and success and work and schedules and, well, whatever else fills the time we could be with those we love. 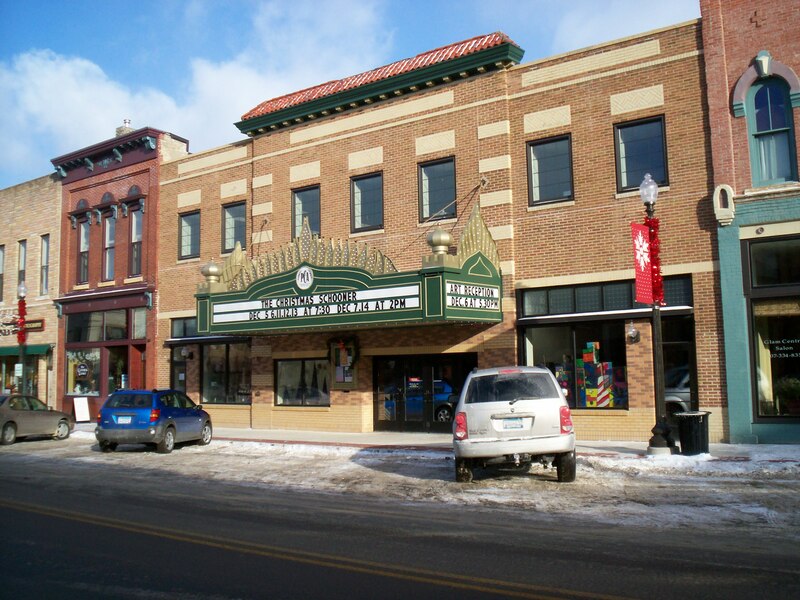 The Paradise Center for the Arts is the cultural hub for theater and art in a historic theatre along Faribault’s Central Avenue. Each December a holiday show is featured. This photo is from a past performance. FYI: Additional performances of The Santa Diaries are set for 7:30 p.m. December 11, 12 and 13 and for 2 p.m. December 14. Julianna Skluzacek is the artistic director for the play featuring 28 passionate performers ranging from elementary age to decades older. Call (507) 332-7372 for tickets from noon – 5 p.m. Tuesday – Saturday or noon – 8 p.m. Thursdays. Tickets may also be purchased an hour before show times. I wouldn’t wait, though. Tickets are selling quickly. The playwrights are flying into Minnesota from the East Coast on Friday and will be here for all three weekend performances. The Santa Diaries photos copyright of Edward Brown/The Merlin Players and published here with permission. I know the son is counting the days. He called yesterday (any communication from him is rare; he’s a busy college student) and we talked for a long time. Six months are way too many not to see him. And thinking about him coming home during The Santa Diaries and all us being together for 1 1/2 days made me cry. This year, more than any, I am so cognizant of how very much my family means to me and how deeply I love them and how I will do anything for them. Fabulous review! I hope the play does well. We need more of this! I agree. I am so thankful we have quality professional theatre and community theatre in Faribault. No need to venture into metro traffic. I just wish more locals would appreciate what we have. I thoroughly enjoyed The Santa Diaries and I, too, hope the productions continues to do well. You summarize well the content of this play–happy, sad, grateful, all wrapped together. And, yes, I am beyond happy that all three of my “kids” and the son-in-law will be together with us for 1 1/2 days. Not on Christmas, but prior. One week and one day to go before my boy arrives back in Minnesota! Excited? You bet! A review of our play by someone we don’t even know! They laughed, they cried, they loved it. We are thrilled and can’t wait to see the show. Two days and counting. Yes, I loved your play. To be able to make an audience member laugh and cry and truly think equals success. And the credit goes to you two playwrights and The Merlin Players. Well done. Enjoy your visit to Faribault. We’re happy to have you here. A stellar review from someone who doesn’t even know us. We are over the moon and can’t wait to see the play this weekend (three times). Life is good! I am grateful for such high quality theatre right here in my community of Faribault. Great writing, an interesting storyline that elicits emotions, just the right mix of humor and seriousness, entertaining song and dance and a talented cast, and you have all of the ingredients for an audience-pleasing show. Thank you, Mala and Laura and The Merlin Players for gifting Faribault with The Santa Diaries. Two of my three children and my son-in-law will be with us on Christmas Eve and Day. That makes me happy. The middle daughter has to work Christmas Eve and it’s too far for her to drive to Minnesota and back to her home for just a day. She missed Christmas with us last year also. You accept it, but never get used to it. I am just thankful to have them here together for 1 1/2 days prior. Just last week I reminded a friend how fortunate she is to have her family in town. And she commented that, yes, she is, and sometimes she takes this for granted.